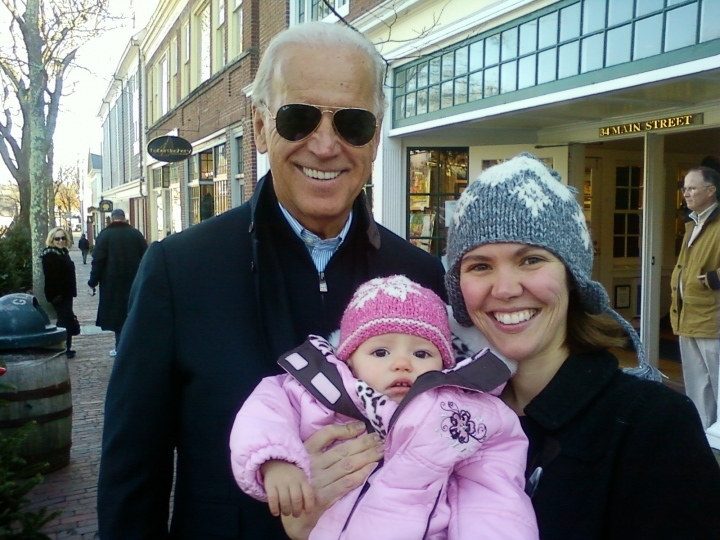 Dear Vice President Biden,I was honored to meet you last Thanksgiving during your trip to Nantucket and thankful for your willingness to pose for a photograph with my daughter, Nora, and me. The picture made a wonderful edition to her baby book. I thought you might enjoy receiving a copy, so I have included one in this letter.Besides finally sending you the picture (nearly a year later! ), I wanted to write you for advice since you oversee both the implementation of the American Recovery and Reinvestment Act and the Middle Class Task Force. I am a twenty-sixyear old stay-at-home mother with big dreams; I am working to start a business that will not only allow me to contribute to my family’s financial security, but will also change my community for the better. Unfortunately, in the process of making my vision a reality, I have hit a large financial stumbling block. I’m hoping that you might be able to give me some suggestions on how to proceed. For background, I’d like to first tell you a little bit about myself and my business idea. I am a 2007 graduate of Austin College, a private liberal arts college in Sherman, Texas, with a bachelor’s degree in philosophy. Two weeks after college graduation, I married my husband, Chris, also a 2007 Austin College graduate, and a few months later moved with him to New York so that he could pursue his dream of attending the Culinary Institute of America (CIA). I supported Chris through the two-year CIA program working first as a low-level recruiter then as the Director of Recruitment in graduate school admissions at Marist and Bard Colleges, respectively. I enjoyed the work and learned quite a lot, but in September of 2009 my world view dramatically shifted with my daughter’s birth. Following a painfully short eight-week maternity leave, I returned to work full-time in a position which required late nights, weekends, and cross-country travel. Luckily, Bard was incredibly baby-friendly; when I had to travel for weeks at a time to the campus I managed in California, I was able to take my infant daughter along with me. But as Nora grew, I knew this situation would be less and less feasible, and my crazy work schedule combined with the nights and weekends necessitated by Chris’ chef career created childcare challenges and left both Chris and me dissatisfied. In April of 2010, Chris was offered a job that seemed like the perfect solution: chef at The Brotherhood of Thieves on Nantucket. We took a leap of faith; I finished out the recruiting season at Bard and moved with Chris and Nora to Nantucket. As a working parent, I’m sure you can understand how incredibly amazing it was for me to be able to stay home with Nora, especially after being in a position which demanded so much of my attention, both in and out of the office. Our whole family is much healthy and happier, and I am so incredibly grateful that we are able to make me staying home work — but it’s not easy. I’m certain you are aware of the high cost of living on Nantucket. We were lucky to find relatively affordable (though still more for less than we were paying in New York) year-round housing. We live in town, which allowed us to sell one of our cars (for which we could no longer afford to pay anyway), and we have actually immensely enjoyed our new walking and biking lifestyle. But everything, from groceries to utilities, is more expensive here and though we have no credit card debt, we’re working hard to pay off what was nearly $90,000 in student loans. We are luckier than most; Chris was given some money in his grandfather’s will which went towards quite a bit of our education costs, but we are still faced with minimum payments that total over $700 each month. Despite being promised health insurance before he accepted the job, Chris’ employer is not offering it to our family, which puts us in a very sticky situation. With many lifestyle concessions, Chris’s salary is just enough to cover our expenses for most of the year, only winter with the added expense of heating oil causes a problem. On Chris’ salary alone, we just qualify for Commonwealth Care’s subsidized health insurance, which is a godsend, but this year even the reduced monthly premium is too much for our budget, and if I make any money at all (which I do need to do to cover the costs of insurance and propane), we no longer qualify for that subsidized plan which means buying market-rate insurance at an even higher premium. It’s a tough situation, because our cost of living is significantly higher than the rest of the state yet is not factored into income limits, and we’re facing a health care donut hole situation where I either make very, very little income or I have to make a larger amount to account for the extra expenses caused by my income. I know you must hear about situations like ours every day. I saw the recent census results and know that our situation is not unique; our income is the median income. We are the middle class. What makes us interesting is how I’ve been trying to cobble together my contribution to our household while staying true to our desire to have our daughter at home with a parent rather than spending her days in the care of a stranger. For awhile, I continued to help Bard part-time, from a distance. I did a data-entry project for a past boss from my college internship. I’ve done some babysitting. I taught myself to build websites in hopes of doing independent web design and development. But beyond all that I have put my heart and soul into writing a solid business plan in hopes of one day becoming a small-business owner. Prior to Nora’s birth, I began learning about natural parenting techniques, including un-medicated childbirth, healthy eating, breastfeeding, baby-wearing and cloth diapering. In the first few months of her life, I realized the joys and ease of parenting naturally, and from that realization grew a desire to support other new and expectant parents through their parenting journeys. While still in New York, I began the process to become a (volunteer) La Leche League Leader. Since moving to the island, and seeing that many of the resources I benefited from as a new mother in New York are missing from Nantucket, my casual interest in helping other parents has turned into a passion, from which has grown a business plan. It is my dream to one day own a natural maternity and baby boutique and community resource center which will support new and expectant families through the full circle of maternity and parenting in a way that encourages the natural process, informed decision making, and informed purchasing. The boutique, which would be called Papoose, would be dedicated to offering high-quality, natural and healthy maternity, postpartum, and baby products that are not currently available on island (such as maternity and nursing clothing, cloth diapers, baby carriers, etc.) and would be committed to being a resource to the Nantucket community by offering classes and workshops that encourage the healthy development of babies, mothers, and families. Over the past year, I have worked hard to make this dream a reality. I earned my lactation counselor certification. I wrote a very thorough, well-researched, and detailed business plan. I visited and spoke with owners of similar businesses in Massachusetts, New Hampshire, and New York. I took full advantage of the services offered by the Small Business Administration and my local SCORE office. I networked here in my community and virtually. After having my business plan fully vetted by key friends, family members, and industry professionals, I began the process of securing a start-up loan. I had high hopes that I might qualify for an SBA-backed loan, possibly through funds provided by The Recovery Act. I quickly learned that I have zero chance of securing a loan. Two banks on island don’t even offer loans to businesses less than three years old; the bank which does offer start-up loans does so only with collateral, which we (as renters) don’t have, and despite having never carried a credit card balance, I learned that our relatively young ages and high student loan debt has not produced an ideal credit score. We spent our savings moving to Nantucket (or making the move possible by paying off student loans for which we would not have been able to manage the monthly payments), and so we have little money to bring to Papoose ourselves. I was incredibly inspired when President Obama gave The State of the Union this year. I am that person who “might not have a lot of money, but has a great idea for a new company” and I want to do big things. It was very disappointing to find out how hard it is to secure funding for a new business, to say the least, but I wasn’t willing to give up. I reached out to family and friends to do my best to get them excited about the idea, I built a website and made a short video explaining what I want to do, and spent what I could of my own money to advertise locally. I created and am trying to sell a membership which would provide lifetime discounts on products and services once the store opens. I have solicited donations. This spring, I was able to raise just under $3000; not nearly what I need, but a start. I was excited to have the opportunity to meet with individuals from Nantucket reMain, a philantrophic project of Wendy Schmidt’s dedicated to revitalizing Nantucket’s year-round downtown business population. My business is in-line with her mission in many ways; I had hoped that she might be interested in taking it on as a project or investment. Unfortunately, though reMain was very enthusiastic about the business plan, as a not-for-profit their hands are tied regarding financially assisting a for-profit (which Papoose must be in order to be able to make retail sales) and Wendy was not interested in becoming personally involved. I’ve been trying to find someone who might be interested in making an equity investment or partnering, but have not yet been able to do so. I’m not letting any of that stop me from helping our community, though. In August, for World Breastfeeding Week, I partnered with Nantucket Cottage Hospital to offer a free breastfeeding class to expectant families, which was a huge success. This fall, I am partnering with the Community Network for Children to offer infant care and baby sign language classes, and plan to teach another breastfeeding class. I’m starting small, happy to be doing anything I can, but still dreaming of the bigger impact I can make by having my own space to teach classes and lead support groups, and by bringing much needed retail products to Nantucket. Frankly, I’m at a loss as to how to proceed from here as far as bringing that dream to life. Mr. Biden, this letter has gotten quite lengthy and if you’ve made it this far, I want to thank you for reading about my family and my dreams. If you have the time to write back to me, I would greatly appreciate any suggestions you might have regarding securing funding for a new business. How does someone smack-dab in the middle class, with lots of student loan debt, a high cost of living, very little income flexibility, and no real property start a business with considerable start-up expenses? If I do need a partner to bring the finances, which I’m open to, how do I find someone with that sort of financial flexibility? Is it completely unrealistic for me to do this at this point in my life? If you are interested and able to contact me, I may be reach via the information below and you can view the website I created for Papoose at http://www.papoosenantucket.com. I wish you the very best and can’t thank you enough for all that you and your wife do for our country. Enjoy the photograph and perhaps we’ll see one another on Main Street again next month! Great letter though I don’t like how you doubt yourself at the end. There is NEVER a point in your life when there’s no point. Do what you love, you’re only truly great at your passions! Of course there’s always a point in trying and it’d be a shame to table the idea for the future, but it’s also important to be realistic and to be aware of our limitations. I need to be careful, because it’s possible I could make just enough money to put us into a very giant hole. Unfortunately that’s where we are right now and though it’s important to dream I also have to be mindful of our family situation.